Studying in Canada for more than 6 months requires a student VISA. 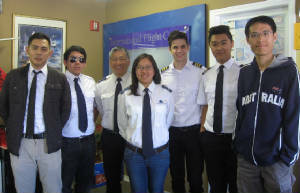 Visit www.cic.gc.ca/english/information/offices/apply-where.asp or read "Entering Canada to study or to work". Before you apply a student permit, you must have proof of funding and a letter of acceptance from International Flight Centre. International Flight Centre will issue Letter of Acceptances after receiving the following information. Application fee of CAN$ 250 (non-refundable) by certificated cheque, money order or bank draft. Immigration, Refugees and Citizenship Canada (IRCC) is reminding international students to prepare for their trip to Study in Canada by reviewing Canada's entry requirements and applying as soon as possible for their study permit.